The faded city of Alashankou, which is in a remote area of Northwest China's Xinjiang Uyghur Autonomous Region, is getting a new lease of life and a chance to transform its economy, thanks to the "One Belt, One Road" initiative. Since the initiative was proposed in 2013, Alashankou, located along the China-Kazakhstan border, has become a crucial outpost for implementing the initiative and has gone through a period of fast economic growth and transformation, local officials said in interviews with the Global Times. "We've been exploring how to support the country's Belt and Road initiative and take advantage of the opportunities to develop our local economy. So far, we've seen some positive trends," said Wang Yong, a deputy Party secretary of the City of Alashankou. In the first quarter of 2017, GDP grew by 54.3 percent year-on-year to 640 million yuan ($92.86 million), according to data Alashankou officials sent to the Global Times on April 26. That followed a growth rate of 25 percent in 2016, the data showed. Fixed-assets investment increased nearly 127 percent in the first quarter with a total investment of 102.32 million in 68 new projects, according to the data. As of April 11 since the city was first established in 2013, fixed-assets investment in Alashankou stood at 2.63 billion yuan in 82 projects, the data showed. With the fast growth in the local economy, hotels, restaurants and other businesses have been busier. "Business has improved a lot in the last a few years," said Ma Chunjiang, who has been running a restaurant in the city for more than 20 years. "It seems many people have returned to Alashankou for business," Ma told the Global Times on April 26. Ma, who moved to Alashankou from the nearby city of Bole in 1993, has witnessed the changes in the city over the years. "When we first moved here, there were no tall buildings," Ma said, "but now you see all these new buildings and roads." Still, business was good at the time because of the rise of border trade, he added. 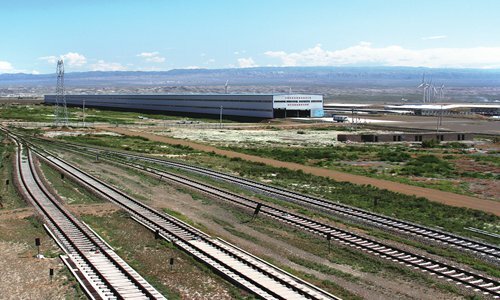 China established the Alashankou railway port in 1993 and the road port in 1995, attracting people from Central Asia and other parts of China to conduct trade. But a few years later, "business took a steep fall, because there was no one coming here anymore," Ma said. 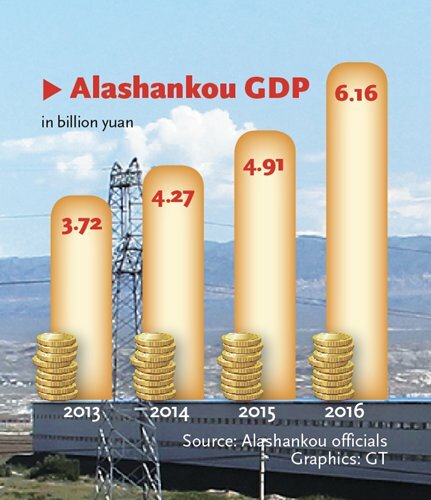 Alashankou entered a "bottleneck" period of slowing growth, due to declining trade and outdated facilities, according to Wang, the city official. Alashankou was just a small port city without a city government until 2013. "The development of Alashankou was merely dependent on the port, there were no other industries … as times passed, this could no longer support the local economy," Wang said. "So we needed to change and find new ways to develop the local economy." The Belt and Road initiative came along at the right time, giving Alashankou preferential policy support. Based on these favorable policies, the city of Alashankou and Alashankou Integrated Free Trade Zone were established in 2013. Subsequently, the central government approved Alashankou's proposal to create designated ports for importing agricultural products, meat and cars, and it also gave the city other flexible policies. "We got these support policies all because of the Belt and Road initiative, and they give us scope to explore many ways to support the implementation of the initiative and develop the local economy," Wang said. Alashankou has been focused on building infrastructure and attracting businesses in areas such as logistics, export processing and tourism, in a bid to expand the city's business portfolio. Given its robust transport network and policy support offers, including tax refunds and quota-free trade, there are more and more companies moving into the city. Alashankou is also a link between the transportation systems of China and Kazakhstan and beyond. As of April 27, there had been 27 China-Europe freight trains passing through Alashankou, according to a press statement sent to the Global Times on April 26. The Alashankou Integrated Free Trade Zone has attracted 168 companies since 2014 when operation started, achieving a trade volume of $5.24 billion, the statement said. Tourism has also been growing, with 260,000 visitors in 2016, up 130 percent. They generated 234 million yuan for the city, according to a separate statement.